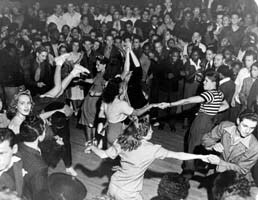 "Jitterbugs are extreme swing addicts who get so excited by its music that they cannot stand or be still...they must prance around in wild exhibitionist dances or yell and scream." NEW CLASSES BEGIN THIS SUNDAY AND MONDAY!!! MORE OF THE SWING RUEDA! It's hard for us to believe it, but a new series of classes is about to begin this coming Sunday and Monday, February 3rd and 4th! Here's your opportunity to come and take terrific new classes at Lindy By The Sea or brush up on the swing dancing you already know! Or both!!! We are really looking forward to meeting lots of new friends in this series, as well as seeing all our returning friends who are coming back for more fun, music and dancing. Make sure to check out our Monday night line-up of classes, too, starting with our Introduction to Shag and Balboa Class from 7pm-8pm! This class is open to absolutely everyone, since it's a beginning level class, and covers everything you will need to know to begin dancing these popular, fast paced swing dances. And from 8pm-9pm, we are offering another month of Swing Rueda, with more moves and steps in this extremely popular new dance -- it's like a square dance, but in a ring and with swing music. Lots of great moves and chances to dance with loads of partners! Then from 9pm-10pm, we continue with our Level Four Lindy Hop class, and ongoing class for our more advanced dancers to work on any steps or styling they want! So make plans to sign up for this great new month of classes...you can even pre-register ONLINE simply by clicking http://www.swingshiftontap.com/lbs-preregistration.asp ! For more information on our classes, including prices, location and parking hints, click http://www.swingshiftontap.com/lbs-classes.asp ! Hope to see you all there!!! This coming Sunday marks the beginning of a new six-weeks series for our Performance Class! This wonderful class is designed for our more advanced students (Level Three and up, or equivalent dance experience) to work on technique and style to a choreographed routine. It's one of our most challenging and rewarding classes, and the response from the participants has been wildly enthusiastic! We then find opportunities to perform the routines locally, giving everyone a chance to really strut their stuff! This particular routine will be to the great, easy-tempo song, "Swingin' On Nothin'" as performed by the Bill Elliott Swing Orchestra on their CD "Live at the Palladium", The class does require partners (but only for the duration of the series...nothing permanent! ), so if you are interested in joining up, find someone whom you really enjoy dancing with and bring them along! The class is from 7pm until 9pm on Sunday nights. This time around, the dates for the class are Feb. 3, 10, 17 and March 3, 10, and 17. For more details on this class click on http://swingshiftontap.com/faqs.htm#1 and scroll down to the Performance Class description!!! RUSTY AND PETER TEACHING AND PERFORMING!!! That's right!!! Next month, the world's largest regularly held swing dance, the Satin Ballroom, returns!!! This time around, the live music is none other than the Bill Elliott Swing Orchestra, the hottest, hardest swingin' big band in the land...DON'T MISS THIS!!! And the beginner's class, held immediately before the dancing begins, will be taught by yours truly, Rusty and Peter! AND THEN...during the course of the evening, there will be a performance, straight from "Swingin' The Century -- The Big Band Show". Rusty and Peter, along with the cast from that terrific show, will be entertaining the crowd with "Mildred, Won't You Behave!" This number was one of the highlights from the stage show, and we're sure you will want to see it...lively, wacky, and FUN FUN FUN!!! So make sure to get your tickets now for the Satin Ballroom, coming to you on Saturday, February 16th!!! You can order tickets from the website...go to http://www.satinballroom.com and click on the tickets button in the left-hand column...only $15 in advance, and $19 at the door!!!! HOPE TO SEE YOU ALL THERE! 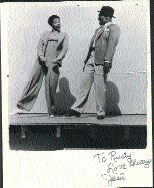 TAP DANCE AND LINDY STYLING WORKSHOP!!! COME TO THE RHYTHM CLUB WEDNESDAY!!! AND IT'S BIRTHDAY TIME FOR "JUST MIKE"
Make sure to come down to Rusty and Peter's Rhythm Club this week...we're giving away a pair of tickets to the upcoming Satin Ballroom, which features the swinging sounds of the Bill Elliott Swing Orchestra!!! Our friend Norm Kumai won the tickets last week for answering our trivia question, "What was the real first name of late swing music legend Peggy Lee?" Norm was the first to answer, shouting out "Norma Jean"! The fact is, Peggy Lee's real name was Norma Deloris Egstrom, but our question WAS about the FIRST NAME, and he did get that bit right, so the tickets went to him. We are not ones to split hairs at the Rhythm Club, after all. We still have two more tickets to give away this week, so make sure to come along have a shot at winning yourself the opportunity to dance the night away at the next Satin Ballroom to the Bill Elliott Swing Orchestra!!! And as if that wasn't PLENTY of reason to join us at the Rhythm Club, we are celebrating TWO birthday Michaels this week -- "Just Mike" and Michael D'Angelo. There are so many Mikes in our swing community that many of them have been given Lindy Nicknames; "Mattel Mike", "Colorado Mike", "Montana Mike". As it happens, this week is the birthday week for two of our Mikes and we want everybody there to wish them a happy birthday and dance with them on their birthday dances! They are both dear friends and we hope the dance is one they'll remember for a long time to come! So come down and dance the night away with us to some of the best DJ'ed swing music anywhere. 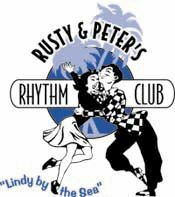 The Rhythm Club is widely regarded as the friendliest swing venue around, and we are proud of that reputation!!! We have a beginner's swing class from 7:30pm until 8:00pm, and then terrific swing music until 11:30pm, with lots of fun and surprises along the way! It's only $6, there's loads of parking, and it's open to ALL AGES! on the Lido Deck -- outside!!! We are thrilled to tell you all that we will again be a part of the 2002 Lindy Cruise to Mexico, brought to you by DanceFun!!! And we already have 28 dancers from the Lindy By The Sea community singed up and rarin' to go! We were involved in last year's cruise and we can honestly say that it was one of the most enjoyable events we have ever done! The line-up of teachers is fantastic, including ourselves, Erik and Sylvia, Shesha and Terra, Steve Conrad, Melinda Comeau, and Sylvia Sykes!!! And the live music for the nightly dances will be handled by none other than the SWING SESSION! This is a cruise of course, so the dance classes are kept to a manageable amount per day (read "two one-hour classes") to allow for plenty of time to relax, lounge around or whatever. The cost for this outstanding weekend cruise to Ensenada starts at only $435 per person (plus port and departure taxes). Make sure to get your registration filled out NOW...we have loads of registration forms at our classes and events, so just ask for one!!! 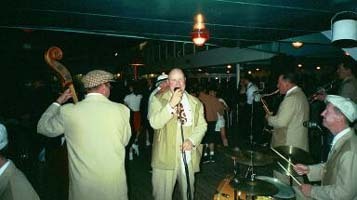 For more information on this incredible event, click http://dancefun.com/lindy/020419swing&lindycruise/lindycruise_pg1.htm ! Hope to see you onboard!!! We had another terrific end-of-series party on Sunday night, January 27th, in spite of the rains that fell all over Southern California. A good seventy or so dancers turned out, umbrellas in hand, to dance the night away with all their friends and fellow students at the Neptunian Woman's Club, and a grand time was had by all! We even got to show a videotape of the Performance Class's display at Suzy Q's from last Friday night. All in all, we had three wonderful hours of swing music and dancing...if you missed this party, remember that we have one at the end of every series (hence the name...) so you can check out the next on on February 24th from 7pm until 10pm. As ever, it will be FREE and open to everyone of all ages! PERFORMANCE CLASS WOWS THE CROWD AT SUZY Q'S!!! We couldn't be prouder of our Performance Class and the amazing showmanship they displayed at Suzy Q's on Friday night! In front of a HUGE crowd of dancers from all over Los Angeles, our students put on a great show, dazzling everyone there with their performance of "Diga Diga Doo"! The response from the audience was thunderous, and we received no less than THREE offers to bring the number to perform at other venues!!! The "Diga Diga Doo" number was preceded by Rusty and Peter doing their vaudeville style song-and-dance number to "Rhythm Is Our Business", which the crowd loved, whooping and hollering along as Rusty and Peter cavorted across the floor! What a great night for Rusty and Peter and the Performance Class from Lindy By The Sea!!! PETER GETS PICTURED IN THE USC NEWSPAPER!!! Rusty and Peter have just begun a new semester at USC, teaching swing dancing as part of the campus's Ballroom Dance Club. They absolutely love teaching at the University, and are proud to say that this is the fourth year they have been there! Just last week, a photographer came along and took some pictures for the school paper, The Daily Trojan, and lo and behold! One of the shots made the front page! 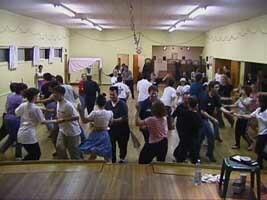 It show's Peter teaching the Shim Sham as a warm-up to the class and includes a caption about the classes. Rusty was just out of the camera's reach to the right, DARN IT....Rusty and Peter plan to find the photographer and give him a hard time about leaving out HALF of a dance team...argh! To see the picture and read the article, click http://www.dailytrojan.com/article.do?issue=/V145/N10&id=03-pixdude.10c.html ! A LETTER FROM SWING FRIEND, GUNILLA!!! It was so nice to read about how you and Peter met. It is like a fairy-tale with the prince and the princess. I hope you keep Swing Shift going for a long, long time. I am in Norway working for Shell and it is very exciting. Everyone is friendly (who would have thought that about those Norwegians - just kidding) and everyone tries to help this confused little Swedish girl (totally new in the world of the "black gold"). 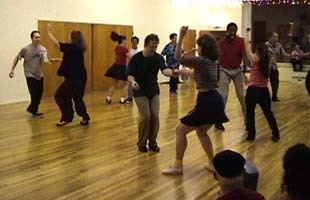 I have found this little club here training mostly Boogie-Woogie and it is tons of fun. However, there are very few people training there and they barely know Lindy at all - a little disappointing. Otherwise, there are more people doing the Norwegian "Fasting" or "Snurrswing" as it apparently is called in Sweden. Unfortunately, this dance does not leave much for the improvising mind. I miss all of you so much and one day I will come back and show some Norwegian stuff. AND A LETTER FROM "SWING CATALOG" GENE!!! Well, I am rather excited to report that Cal Poly Pomona is the proprietor of a swing dance club! The club met Thursday, Jan 17, to teach some basic swing moves (which I was not able to witness, as I got the info about the club later) and had a small dance that Thursday evening. It is a fairly young crowd (college students) and fairly small (about 15 people), but hey, it's swing. Anyway, the fever survives and I am happy to admit that, when relaxing from studies and wishing desperately that I could commute down to Playa Del Rey on Wednesdays, I will have somewhere to vent my repression on Thursday evenings if time permits. I miss y'all and hope to see everyone come spring break! For those of you who may be wondering just what this Swing Rueda is that everyone keeps enthusing about, here's your chance to see it for yourself, right here on your own computer screen! This week's link comes to us via Tom Buechler, and is to a website that shows a video clip of a Swing Rueda being done in Texas. So you can see for yourself how darned much fun this dance is, and then show up on Monday night at 8pm to take the class and get in on the fun! One thing though: If you didn't take the last Rueda series, you've got to catch up -- so find someone who was in the class and work with them... or there's always privates with Rusty (310 606 5606). The link for the Texas Rueda is at http://glitterlisa.com/video/swingruedahsds.rm We know you'll like what you see!!! p.s. We just wanted to enclose this lovely phrase from two of our dance instructor pals, Rob and Diane, of San Francisco: "The 8 Count basic of Lindy Hop, the window to the world of swing!" *Wondering what the heck a "gate" is? This was a phrase popularized by 1940's comedian, JerryColonna, who would holler it out every time he was introduced on the Bob Hope radio program. It was a friendly salutation to a swing cat (dancer or swing music enthusiast).